The Comment Reply Email Notification app is a very lightweight app does what it says on the tin - allows your blog's commenters to subscribe to receive email notifications when somebody replies to their comments. Once you've activated the Comment Reply Email Notification app in your website admin panel, all the hard work has been done. 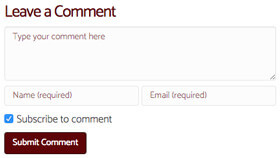 Provided your blog is set up to enable comments you should now see a new option on the comment form for "Subscribe to comment". This option will be checked by default. When a user submits a comment with the option enabled, they will receive an email when somebody replies to that comment containing a link to the post, the content of the reply, a link to reply to the comment, and a link to unsubscribe from the comment.